Hi everyone, and happy July! I hope that you all had a great June. Mine was fantastic and I got to do a lot of fun things. I'm looking forward to July, and have quite a few goals for the month! Since June was so busy and I had my half marathon, I kinda forgot about my goals for the month and instead took it easy. Hoping that I get back on track in July, because my next half marathon training starts at the end of the month! I also created a 30 x 30 goal list (thirty things I want to accomplish by the time I'm thirty) for my birthday on Sunday! Each month, I'll update you in my monthly goals on any items that I've crossed off. - Run 100 miles. LOL NO. I was recovering from my half marathon at the beginning of the month, and also had two other races. In between those, I ran a bit but kept it low-key and low-mileage. I finished with 60 miles, but I also walked/ran close to 50 miles during my Philly and NYC weekend, so I definitely got lots of miles in! - Switch up my cross training routine. Yes. I wasn't great about cross training this month, but I did do different things (worked out at Pilates Fest, did yoga in the park a few times) and I also created a new cross training schedule for my next training plan! - Run at least 3 runs with Run Club. Yes. I joined two Wednesday runs and one Saturday run! I even made it for a Pub Run, which was a ton of fun. - Read 2 non-fiction books. Yes. I read 10 Minute Declutter by SJ Scott and Barrie Davenport, and The 50 Best Tips Ever For Running Fitter, Faster and Forever by Scott Welle. They were both decent, but didn't really go in to enough details for the books to be really useful. Next time I'll go for more in-depth books! - Finish my travel scrapbooks. Yes. I used the weekend that I was sick and Dan was away to finally finish my scrapbook from my trips in 2013-2014. Now I just have to get more supplies so I can work on my recent trip! Here's the final page, which I just put random pictures and one of my favorite quotes from Hans Christian Anderson! - Create a budget. Yes. Check out my post here! - Cook some Mexican food! Yes. Check out my post here! 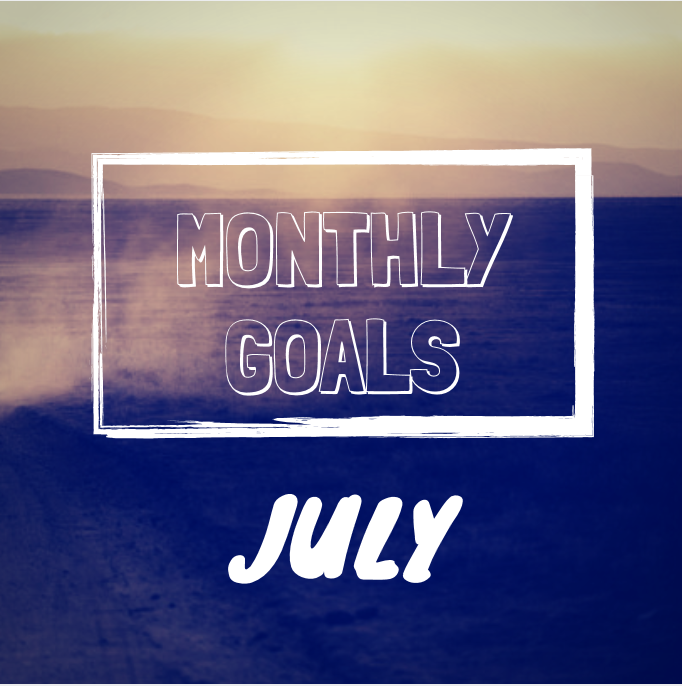 Moving on to my goals for the month of July! It's going to be a busy month. - 3 runs with Run Club. This was a good amount last month, and I think it will help my training for July. I'm almost up to my 10th run with the group, which means I'll get a $20 giftcard to the store! - 2 cross training sessions each week. Time to get back into it! I want to incorporate more yoga and strength training into this cycle. - Get over 15,000 steps a day. I've been doing pretty well hitting the predetermined goal of 10,000 steps a day, so I'm going to try to exceed that and get more every day. I still sit way too much at work, so I need to get up and move more often! - Start bike riding. I don't have a lot of biking experience, but I'm hoping to get more into it. My goal this month is to try it out and go on a few rides! - Eat breakfast every day. I mentioned this in my first #WIAW post. I struggle with eating breakfast every day, so it's my goal to have something either at home or bring something to work. I'll dedicate a post to easy and quick breakfast ideas in July! - Finish a craft project. Last month my goal was to finish my scrapbook, and this month I want to keep those creative juices flowing! I have a few half-completed projects that I've worked on throughout the past few years, and I want to finish at least one of them. Look out for pictures next month with the finished product(s)! - Read 3 books. Time to up the ante again! This time I'll try to add one autobiography, which is always an interesting genre! - Commit to 10 minute de-clutter. My book from last month had some great tips, one of which being to commit 10 minutes each day (same time each day to get in the habit) to de-clutter your apartment/house. I'll make sure to do this every evening and I'll let you know the results next month! Who else likes doing arts and crafts? Good goals for the month, I always say I need to bike more and never do. I also like doing artsy things, whether it be painting or making a new medal hanger. In fact one of my goals is to make a new one this month. Same here! We can do it :) That's a great goal to have, and I'm sure it will look great once you're done! Good progress on your goals last month! 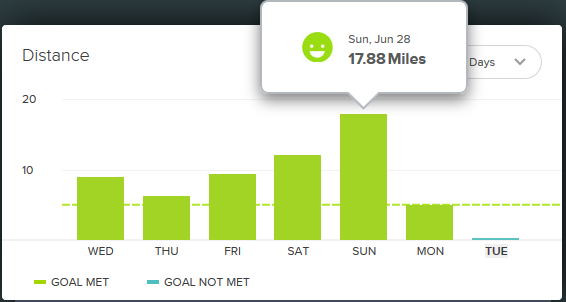 I was just saying that I'm not sure I want to join the FitBit trend, but I would love to know exactly how much I walk. In general I walk so much and bet the mikes really rack up. The last time we were in NYC, all we did was walk too. I ate so much but actually lost weight just because of all the walking! Great goals for this month too. I haven't read that deck utter book, but I do try to devote just a few minutes to house chores every day, and it does help. Happy July! Thank you Jennifer! I felt the same way about FitBit, but I got one for free from work (we have a recognition program, and you can redeem your "points" for lots of merchandise, so I decided to redeem mine for a fitbit!) and I love it now! I'm sure if I focus on cleaning a little each day my apartment will stay neat. I just let it go for a month and have to spend hours getting everything done. Not smart! Great job! I sometimes scrapbook but I haven't done it for a few years. Thanks! I just started doing it in college for each year and loved doing it! Haha we are SO alike it's almost scary. I already told you, but I'm definitely picking up her book ASAP! Kristen is my favorite person..pretty much ever. Love her! I am hoping to pick my running back up, but also work on eating out less and sticking to my budget I made (YAY for your blog post - I LOVE it!!) And I used to scrapbook ALL. THE. TIME. I have so many at my parents house. They're definitely hilarious to look at. Especially the high school ones. Haha. Hope you have a great day! Eating out less is a great goal! I definitely have to do that as well. It's such a money killer! I'm so glad that post helped you :) I'm kind of glad I didn't make one in high school..even looking back at my freshman book in college is a little embarrassing! I hate arts and crafts! I have no patience for it. Although, if I drink a couple glasses of wine, get naked and put some sultry music on, I could possibly do some painting on canvas. Oh, and I need to eat breakfast every day too, so I'm looking forward to your breakfast ideas. Yippee! Hahaha wow Suzy! Whatever works for you I guess :) I hope my breakfast ideas help you out!! Working on the post now! I'm lucky to have a few clubs close by! Definitely something I have to take advantage of more. Smoothies are a great idea for breakfast!! I used to scrapbook everything, but quit. I like you do your trips in a travel book. Our trips are just mixed into the kids books. It makes it much easier I think..but then again I don't have kids so it's easy to keep it in a separate book! I like that idea of 10 minute declutter. I find myself ovewhelmed and don't know where to start sometimes.